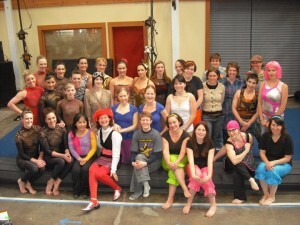 In 2009, Revolva co-founded Circus Artemis: Portland Women’s Circus — which sold out a 400-seat venue for three nights in a row, for its debut run. Here she is (R, pink hair), with the 2010 cast. Girl power! Now based in Oakland, CA, Revolva has rocked the stage with troupes such as: Circus Artemis, New Old Time Chautauqua Vaudeville Tour, and Wanderlust Circus - served as opening/support entertainment for bands such as OK Go, Weird Al Yankovic and Los Straitjackets– and been nabbed as a hot act by big-name clients such as Yahoo, Google and Ubuntu. 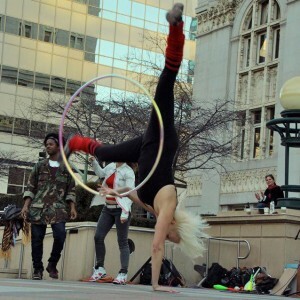 She has also won the 2010 “Fire Idol” competition at Burning Man, served as the 2011 face of Synergy Fire Hoops, won a 2012 international Hoopie Award, and earned The Busking Project’s top pick award in the 2011 “How do you contribute to public space?” contest. Being a role model for girls and women is of paramount importance to Revolva. That’s why you’ll find her exploding onto the stage with tight technical skills and extra humor, sometimes talking into a mic instead of just doing a beautiful dance, and staying long after the show’s over to chat with any audience members who need to meet a female comedy variety act (a genre often dominated by male performers). 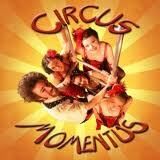 In line with her commitment to empowering women, in 2009, Revolva co-founded Circus Artemis: Portland Women’s Circus with Shireen Press of Flamebouyant Productions and Kricket Caffery of Peg Stilts. The mission of the circus was to work with women artists and technicians in a supportive, respectful, and collaborative performance environment and to create high-quality circus productions that inspire, amaze, and empower audiences, the wider community, and each other. For several sold-out runs, Circus Artemis did just that. Upon moving to Oakland, CA, in 2010, Revolva also began dedicating time and performance to Bay Area women’s activism. In 2013, she co-organized, co-emceed and performed at One Billion Rising Oakland, an event with over 500-attendees, held on the steps of Oakland’s City Hall, dedicated to ending violence against women. 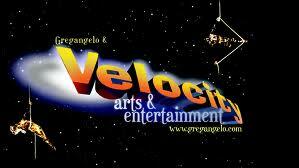 Blessed with the super power of creating stories, Revolva attempts to use her talent for the greater good. And she continues to travel the world, fusing hoop skills with writing chops to prove that storytelling and the movement arts are a truly dynamic duo. Read more of Revolva’s rave reviews here!